If a picture is worth a thousand words, a video can be priceless, particularly when you’re preparing a presentation for your website or just trying to show your parents who live in another state how they should fix a problem with their computer. There are plenty of solutions for recording the screen of your Mac, but Claquette 1.1.2 (Mac App Store link) stands out for also capturing live video and audio from a camera and microphone while it creates a movie from your desktop. The recording can either be exported in a variety of convenient formats, depending on your intended use, or sent to Apple’s Motion as a multi-layered project, from where it can be edited to your heart’s content. Claquette can also record audio and video from separate devices, making it a perfect companion for capturing a presentation at your local user group or conference. 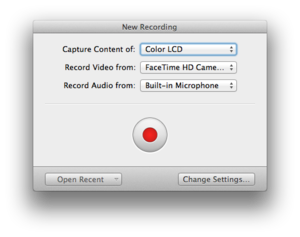 Create screencasts or video with your Mac's webcam easily and quickly.